Kodachrome is a brand name for a non-substantive, color reversal film introduced by Eastman Kodak in 1935. It was one of the first successful color materials and was used for both cinematography and still photography. Because of its complex processing requirements, the film was sold process-paid in the United States until 1954 when a legal ruling prohibited this. Elsewhere, this arrangement continued. For many years it was used for professional color photography, especially for images intended for publication in print media. Because of the growth and popularity of alternative photographic materials, its complex processing requirements, and the widespread transition to digital photography, Kodachrome lost its market share, its manufacturing was discontinued in 2009 and its processing ended in December 2010. Kodachrome was the first color film that used a subtractive color method to be successfully mass-marketed. Previous materials, such as Autochrome and Dufaycolor, had used the additive screenplate methods. Until its discontinuation, Kodachrome was the oldest surviving brand of color film. It was manufactured for 74 years in various formats to suit still and motion picture cameras, including 8 mm, Super 8, 16 mm for movies (exclusively through Eastman Kodak), and 35 mm for movies (exclusively through Technicolor Corp as "Technicolor Monopack") and 35 mm, 120, 110, 126, 828 and large format for still photography. Kodachrome is appreciated in the archival and professional market for its dark-storage longevity. Because of these qualities, it was used by professional photographers like Steve McCurry, Peter Guttman and Alex Webb. McCurry used Kodachrome for his well-known 1984 portrait of Sharbat Gula, the "Afghan Girl" for the National Geographic magazine. It was used by Walton Sound and Film Services in the UK in 1953 for the official 16 mm film of the coronation of Elizabeth II of the United Kingdom. Copies of the film for sale to the public were also produced using Kodachrome. The first Kodak product called Kodachrome was invented by John Capstaff in 1913. His Kodachrome was a subtractive process that used only two colors: blue-green and red-orange. It required two glass plate negatives, one made using a panchromatic emulsion and a red filter, the other made using an emulsion insensitive to red light. The two plates could be exposed as a "bipack" (sandwiched emulsion to emulsion, with a very thin red filter layer between), which eliminated the need for multiple exposures or a special color camera. After development, the silver images were bleached out with chemistry that hardened the bleached portions of the gelatin. Using dyes which were absorbed only by the unhardened gelatin, the negative that recorded the blue and green light was dyed red-orange and the red-exposed negative was dyed blue-green. The result was a pair of positive dye images. The plates were then assembled emulsion to emulsion, producing a transparency that was capable of surprisingly good (for a two-color process) color rendition of skin tones in portraits. Capstaff's Kodachrome was made commercially available in 1915. It was also adapted for use as a 35 mm motion picture film process. Today, this first version of Kodachrome is nearly forgotten, completely overshadowed by the next Kodak product bearing the name Kodachrome. Mannes and Godowsky first took an interest in color photography when in 1917, still high school pupils at the time, they saw a movie called Our Navy, a movie made using a four color additive process. Both agreed the color was terrible. After reading up on the subject in the library they started to experiment with additive color processes. Their experiments were continued during their college years, eventually producing a camera having two lenses that project images side by side on a single strip of film. The color rendition of this additive two-color process was not too bad, but aligning the two lenses of the projector needed was too difficult. Their experiments, which continued after they finished college, turned from multiple lenses that produce multiple, differently colored images that had to be combined to form the final transparency, to multiple layered film in which the different color images were already combined, perfectly aligned. Such a multi-layered film had already been invented and patented in 1912 by the German inventor Rudolph Fischer. Each of the three layers in the proposed film would be sensitive to one of the three primary colors, and each of the three layers would have substances (called "color couplers") embedded in them that would form a dye of the required color when combined with the by-products of the developing silver image. When the silver images are bleached away, the three color dye image would remain. Fischer himself did not find a way to stop the color couplers and color sensitizing dyes from wandering from one layer into the other, where they would produce unwanted colors. Mannes and Godowsky followed that route, started experimenting with color couplers, but their experiments were hindered by a lack of money, supplies and facilities. In 1922 Robert Wood, a friend of Mannes, wrote a letter to Kodak's chief scientist Mees, introducing Mannes and Godowsky and their experiments, and asking if Mees could let them use the Kodak facilities for a few days. Mees offered to help, and after meeting with Mannes and Godowsky agreed to supply them with multi-layer emulsions made to Mannes and Godowsky's specifications. Financial aid, in the form of a $20,000 loan, was supplied by the investement firm Kuhn, Loeb and Company, who had Mannes and Godowsky's experiments brought to their attention by a secretary working for that firm Mannes had acquainted. By 1924 they were able to patent a two-color process. The important part of that patented process was a process called controlled diffusion. By timing how long it took for an image to form in the top layer, but not yet in the next layer beneath that one, they began to solve the problem that Fischer could not. Using this time-controlled way of processing one layer at a time, they could create the dye image of the required color in only that layer in which it is required. Some three years later they were still experimenting using this controlled diffusion method of separating the colors in the multi-layer emulsion, but by then they had decided that instead of incorporating the color couplers into the emulsion layers themselves, they could be added to the developing chemicals, solving the problem of wandering color couplers. The only part left of Fischer's original problem with a multi-layer emulsion were the wandering sensitizing dyes. In 1929 money ran out, and Mees decided to help them once more. Mees knew that the solution to the problem of the wandering dyes had already been found by one of Kodak's own scientists, Leslie Brooker. So he gave Mannes and Godowsky enough money to pay off the loan Kuhn Loeb had supplied and offered them a yearly salary. He also gave them a three-year deadline to come up with a finished and commercially viable product. Not long before the three-year period would expire, at the end of 1933, Mannes and Godowsky still had not managed to come up with anything usable, and thought their experiments would be terminated by Kodak. Their only chance for survival was to invent something in a hurry. Something that the company could put into production and capitalise. Mees, however, granted them a one-year extension, and still not having solved all the technical challenges they had to solve, they eventually presented Mees with a two-color movie process in 1934. Two-color, it must be noted, as was the original Kodachrome invented by John Capstaff some 20 years earlier. Mees immediately set things in motion to produce and market this film, but just before Kodak was about to introduce the two-color film in 1935, Mannes and Godowsky completed work on the long-awaited but no longer expected, much better, three-color version. On April 15, 1935, this new film, borrowing the name from Capstaff's process, was formally announced. 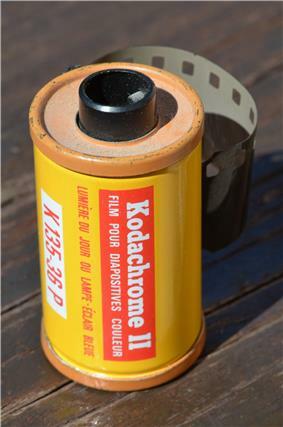 Kodachrome was first sold in 1935 as 16 mm movie film. and the following year it was made available in 8 mm movie film, and in 35mm and 828 formats for stills cameras. In later years, Kodachrome was produced in a wide variety of film formats including 120 and 4x5, and in ISO/ASA values ranging from 8 to 200. Competing transparency films, such as Fujifilm Rochester, New York and most of the pictures have been published on the Internet by Vanity Fair magazine. Kodachrome was the subject of Paul Simon's song "Kodachrome", and Kodachrome Basin State Park in Utah was named after it, becoming the only park named for a brand of film. 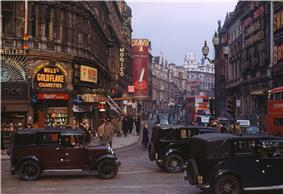 Kodachrome photo by Chalmers Butterfield of Shaftesbury Avenue from Piccadilly Circus, in the West End of London, c. 1949. If you have good light and you’re at a fairly high shutter speed, it's going to be a brilliant color photograph. It had a great color palette. It wasn't too garish. Some films are like you're on a drug or something. Velvia made everything so saturated and wildly over-the-top, too electric. Kodachrome had more poetry in it, a softness, an elegance. With digital photography, you gain many benefits [but] you have to put in post-production. [With Kodachrome,] you take it out of the box and the pictures are already brilliant. Kodachrome is generally used for direct projection using white light. As such, it possesses a relatively high contrast. For professional uses, where duplication is expected and required, a special version, Kodachrome Commercial (KCO), was available in a 35 mm BH-perforated base (exclusively through Technicolor) and in a 16 mm base (exclusively through Eastman Kodak's professional products division). In both cases, Eastman Kodak performed the processing. Kodachrome Commercial has a low-contrast characteristic which complements the various duplication films with which it is intended to be used: silver separation negatives for 35 mm (controlled exclusively by Technicolor) and reversal duplicating and printing stocks for 16 mm (controlled exclusively by Eastman Kodak). Kodachrome Commercial was available until the mid-1950s, after which Ektachrome Commercial (ECO) replaced it for these specific applications. After the late 1950s, 16 mm Kodachrome Commercial-originated films (and Ektachrome Commercial-originated films as well) were quite often duplicated onto Eastmancolor internegative film, after which these films were printed on Eastmancolor positive print film, as a cost-reduction measure, thereby yielding relatively low-cost prints for direct projection. When stored in darkness, Kodachrome's long-term stability under suitable conditions is superior to other types of color film. While existing Kodachrome materials from before Kodak simplified the development process in 1938 are almost always faded, images on Kodachrome slides and motion picture films made after this point retain accurate color and density to this day. It has been calculated that the yellow dye, the least stable, would suffer a 20% loss of dye in 185 years. This is because developed Kodachrome does not retain unused color couplers. However, Kodachrome's color stability under bright light, for example during projection, is inferior to substantive slide films. Kodachrome's fade time under projection is about one hour, compared to Fujichrome's two and a half hours. A 35mm Kodachrome transparency, like other 35mm transparencies on films of comparable ISO rating, contains an equivalent of approximately 20 megapixels of data in the 24 mm x 36 mm image. Scanning Kodachrome transparencies can be problematic because of the film's tendency to scan with a blue color cast. Some software producers deliver special Kodachrome color profiles with their software to avoid this. An IT8 calibration with a special Kodachrome calibration target is necessary for accurate color reproduction. Many scanners use an additional infrared channel to detect defects, as the long wave infrared radiation passes through the film but not through dust particles. Dust, scratches, and fingerprints on the slide are typically detected and removed by a scanner's software. Kodachrome interacts with this infrared channel in two ways. The absorption of the cyan dye extends into the near infrared region, making this layer opaque to infrared radiation. Kodachrome also has a pronounced relief image that can affect the infrared channel. These effects can sometimes cause a slight loss of sharpness in the scanned image when Digital ICE or a similar infrared channel dust removal function is used. A typical plastic 35mm Kodachrome slide from the 1990s showing logo and text on the reverse side. The first step in the process was the removal of the antihalation backing with an alkaline solution and wash. The film was then developed using a developer containing phenidone and hydroquinone, which formed three superimposed negative images, one for each primary color. After the first developer was washed out, the film underwent re-exposure and redevelopment. Re-exposure fogged the silver halides that were not developed in the first developer. A color developer then developed the fogged image, and its exhaustion products reacted with a color coupler to form a dye in the color complementary to the layer's sensitivity. The red-sensitive layer was re-exposed through the base of the film with red light, then redeveloped forming cyan dye. The blue-sensitive layer was re-exposed through the emulsion side of the film with blue light, then redeveloped forming yellow dye. The green-sensitive layer was redeveloped with a developer that chemically fogged it and formed magenta dye. After color development, the metallic silver was converted to silver halide using a bleach solution. The film was then fixed, making these silver halides soluble and leaving only the final dye image. The final steps were to wash the film to remove residual chemicals which might cause deterioration of the dye image, then to dry, cut, and mount the film in slide frames. Due to its complex processing requirements, Kodachrome film was initially sold at a price which included processing by Kodak. An envelope was included with the film in which the photographer would send the exposed film to the nearest of several designated Kodak laboratories. The film was processed, mounted in 2" x 2" cardboard mounts in the case of 35 mm slides, and returned by mail to the sender. After 1954, as a result of the case United States v. Eastman Kodak Co., this practice was prohibited in the United States as anticompetitive. 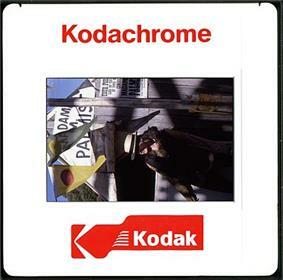 Kodak entered into a consent decree that ended this practice in the United States, and allowed independent processing laboratories to acquire the chemicals needed to process Kodachrome films. The use of transparency film declined in the 1980s and 1990s which, combined with competition from Fuji's Velvia slide film, caused a drop in Kodachrome sales. Some business analysts speculated that heavy subsidies by the Japanese government propped up Fuji and may have even allowed dumping of Fuji's films at below the cost to manufacture them. Kodachrome products were gradually discontinued and on June 22, 2009, Kodak announced that the remaining film, Kodachrome 64, would no longer be manufactured. Because of the decline in business, many Kodak-owned and independent Kodachrome processing facilities were closed. The loss of processing availability further accelerated the decline in Kodachrome sales. In 1999, Kodak attempted to increase the availability of K-14 processing through its K-Lab program, where small labs equipped with smaller Kodak processing machines would supplement Kodak's own processing services. This effort did not endure and all the K-labs were closed by 2005. On July 25, 2006, extensive documentation about Kodak's Lausanne Kodachrome lab's impending closure was sent to the European Parliament by the Dutch office of the European Parliament because, although located in Switzerland, the facility served all of Europe and its closure would affect European photographers. The Parliamentary committees for Culture and Education and for Internal Market and Consumer Protection studied the matter. After its Lausanne processing facility closed, Kodak subcontracted the processing work to Dwayne's Photo, an independent facility in the United States, which became the world's last Kodachrome processing facility. Dwayne's processing of 35 mm films was fully endorsed by Kodak, but its Super-8 process was not endorsed because it required more agitation. Films sent for processing in the USA were mailed directly to Dwayne's, while those in Europe were sent to the Lausanne facility's address and forwarded to Dwayne's. Dwayne's Photo announced in late 2010 that it would process all Kodachrome rolls received at the lab by December 30, 2010, after which processing would cease. As Dwayne's final processing deadline approached, thousands of stored rolls of film were sent in for processing. Once film received by the deadline had been developed, the world's last K-14 processing machine was taken out of service. The final roll to be processed was exposed by Dwayne Steinle, owner of Dwayne's Photo. The cessation of processing by Dwayne's Photo is commemorated in the book Kodachrome – End of the Run: Photographs from the Final Batches, edited by photographers Bill Barrett and Susan Hacker Stang with introductory essays by famed Time Magazine worldwide pictures editor Arnold Drapkin and Dwayne's Photo vice president Grant Steinle. The book presents a year of pictures shot by Webster University photography students on more than 100 rolls of by-then rare Kodachrome film and processed by Dwayne's on the very last day (extended to January 18, 2011) before processing chemicals ran out forever. Kodachrome film can no longer be processed in color, but it can be processed in black and white by some labs that specialize in obsolete processes and old film processing. The Kodachrome product range diminished progressively through the 1990s and 2000s. Kodachrome 64 film in 120 format was discontinued in 1996. Kodachrome 25 was discontinued in 2002. Kodachrome 40 in the Super 8 movie format was discontinued in June 2005, despite protests from filmmakers. Kodak launched a replacement color reversal film in the Super 8 format, Ektachrome 64T, which uses the common E-6 processing chemistry. Kodachrome 200 was discontinued in November 2006. Kodachrome 64 and Kodachrome 64 Professional 135 format were discontinued in June 2009. ^ "Brilliant vintage Hollywood 8 x 10 Kodachromes sell on ebay". Photo.net. February 26, 2011. Retrieved November 21, 2011. ^ Carma Wadley (June 25, 1999). "Range of Color: Kodachrome Basin Lives up to Name it Got by Accident". Deseret News Publishing Company. Retrieved December 24, 2011. ^ a b "Kodak: A Thousand Words – A Tribute to KODACHROME: A Photography Icon". Kodak. June 22, 2009. Retrieved September 18, 2009. ^ a b c d Ben Dobbin (September 22, 2008). "The digital age takes Kodachrome away". USA Today. Retrieved June 23, 2009. ^ "BFI | Film & TV Database | Coronation Regina (1953)". Ftvdb.bfi.org.uk. April 16, 2009. Retrieved September 18, 2009. ^ "Image Forming Materials – Tint, Tone and Other Colour Processes". ^ A.L.M. Sowerby (Ed) (1961). Dictionary of Photography: A Reference Book for Amateur and Professional Photographers (19th ed.). London: Iliffe Books Ltd.
^ Capstaff, a former portrait photographer and physics and engineering student, had already worked on color photography before he joined C.K. Mees and other former Wratten and Wainright employees in their move to Rochester in 1912 - 1913, after Eastman had bought that company to persuade Mees to come and work for him. ^ a b Douglas Collins (1990). The Story of Kodak (1st ed.). New York: Harry N. Abrams, Inc.
^ Robert Tomsho (June 23, 2009). "Kodak to Take Kodachrome Away". The Wall Street Journal. p. B6. ^ "Leopold Godowsky, Jr.". Invent.org. Retrieved February 28, 2007. ^ "Leopold Mannes". Invent.org. Retrieved February 28, 2007. ^ "Popular Mechanics". Books.google.com. Retrieved 2015-05-14. ^ "Kodak: History of Kodak: Milestones 1930 – 1959". ^ a b c Lane, William S. in Buzit-Tragni; et al. (January 25, 2005). "Coatings on Kodachrome and Ektachrome Films: Appendix A – Timeline for the Kodak Kodachrome Films" (PDF). Retrieved June 9, 2009. ^ Jim Axelrod (December 26, 2010). "Kodachrome: The Legendary Film's Last Days". CBS News. Retrieved December 29, 2010. ^ a b "Last Kodachrome roll processed in Parsons". The Wichita Eagle. July 14, 2010. Retrieved July 22, 2010. ^ "National Geographic: The Last Roll of Kodachrome". YouTube.com. 2013-01-12. Retrieved 2015-05-14. ^ "Kodak Color Films" (PDF). ^ "Presentation to Rochester Photographic Historical Society". ^ "Kodak announces Kodachrome to be discontinued". ^ a b Unknown author (March 26, 2009). "LaserSoft Imaging Introduces the Perfect Kodachrome Workflow". Thomson Reuters. Retrieved June 8, 2009. ^ "Eastman Kodak kills its colour-true Kodachrome". Toronto Star. June 23, 2009. ^ a b David Friend (February 9, 2011). "The Last Roll of Kodachrome—Frame by Frame!". Vanity Fair. Retrieved February 1, 2011. ^ Kattelle, Alan (2000). Home Movies: A History of the American Industry, 1897-1979. Nashua, New Hampshire: Transition Publishing. p. 186. ^ The Permanence and Care of Color Photographs (Chapter5) (PDF). ^ "The Permanence and Care of Color Photographs (Chapter 6)" (PDF). Wilhelm Imaging Research. Retrieved December 27, 2006. ^ "Long Term Color Stability of Kodachrome". Huennebeck-online.de. August 20, 2009. Retrieved September 18, 2009. ^ Langford, Michael (2000). Basic Photography (7th Ed.). Oxford: Focal Press. p. 99. ^ David Brooks (June 2009). "Please Don’t Take My Kodachrome Away; New & Better Profiled Kodachrome Scanning". Source Interlink Media. Retrieved June 8, 2009. ^ "Scanner Technology". Kenrockwell.com. Retrieved September 18, 2009. ^ "About Digital ICE Processing". Pearsonimaging.com. November 8, 2007. Retrieved September 18, 2009. ^ "Kodachrome: The Legendary Film's Last Days". CBS News. December 26, 2010. Retrieved December 31, 2010. ^ a b c d "Processing Steps – Processing Kodachrome Film (PDF)" (PDF). Eastman Kodak Company. 2000. Retrieved March 1, 2009. ^ "FindLaw | Cases and Codes". Caselaw.lp.findlaw.com. Retrieved September 18, 2009. ^ "Kodachrome Slide Dating Guide". Historicphotoarchive.com. Retrieved September 18, 2009. ^ "Brief for the United States : U.S. v. Eastman Kodak Co". Usdoj.gov. Retrieved September 18, 2009. ^ "1930–1959". Kodak.com. May 15, 1950. Retrieved September 18, 2009. ^ "Fuji accused of unfair trade practices". Retrieved March 28, 2015. ^ "Kodak Retires Kodachrome Film". PhotographyBLOG. Retrieved June 22, 2009. ^ a b "75th Anniversary of Kodachrome, Presentation by Bill Lane to Photographic Historical Society". randrews4.com. Retrieved January 2, 2011. ^ "K-LAB Processors Improve KODACHROME Film Processing". Kodak.com. Retrieved September 18, 2009. ^ "Culture and Education Committee". ^ "Internal Market and Consumer Protection". ^ a b "Slide Film Processing". Dwayne's Photo. ^ Sulzberger, A. G. (December 29, 2010). "For Kodachrome Fans, Road Ends at Photo Lab in Kansas". The New York Times. ^ "Kodachrome—The end of an era". dwaynesphoto.com. Retrieved November 27, 2009. ^ "Kodachrome last remaining film roll developed in Kansas - BBC News". Bbc.co.uk. Retrieved 2015-05-14. ^ See Susan Stang's detailed description of the collaboration in Bill Barrett and Susan Hacker Stang (editors), Kodachrome – End of the Run: Photographs from the Final Batches (St. Louis, Webster University Press, 2011), pages 2-10. ^ "Kodak News: Kodachrome 40 Movie film (Type A)/Super 8 Discontinued" (PDF). ^ "Fans beg: Don't take Kodachrome away". International Herald Tribune. June 1, 2005. Retrieved August 2, 2007. ^ Unknown (May 10, 2005). "Kodak Announces New Color Reversal Film Added to Portfolio". Penton Media, Inc. Retrieved June 8, 2009. ^ "Sorry, Paul Simon, Kodak’s axing Kodachrome". MSNBC Interactive News LLC. June 22, 2009. Retrieved June 22, 2009. ^ "KODACHROME Discontinuation Notice". Kodak. June 22, 2009. Retrieved June 23, 2009. George Eastman House Museum: – "Saying "farewell" while celebrating 75 years of Kodachrome"
Kodachrome, Photographic film, Kodak, Color transparency film, Leopold Godowsky, Jr.